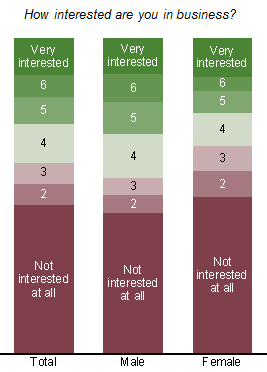 In our research on business interest, we focused on the level of interest amongst the general public. We were working under the assumption that interest amongst business leadership must be high. However we have recently become privy to the shocking revelation that even those in positions of power are not interested in the business world. I am talking, of course, about Bored Members. A requisite part of any company, the Bored of Directors is responsible for overseeing a company’s activities. How can you possibly expect the man on the street to be interested in business, when you’ve got such a disengaged group of individuals in positions of power? This fix is quick, and easy – scrap Boreds, stop hiring Bored Members, and start hiring Engaged Members, to the Engagement Committee. In business, as in life, you’ve got to lead by example. The internet age has changed the way people consume information. Where previously the power was in the hands of the producer, on the limitless internet it is now the end user of information who is in control. With endless topics to choose from, the coronation is now complete; the consumer is king. In this consumer-centric world, an article’s title has become all the more important. Description is no longer sufficient; now one must be titillated or intrigued to be persuaded to click through. People also love lists. Despite this new world order, the business world has not yet cottoned on, with the same old descriptive, informative headlines being rolled out. Only today, example headlines included such drones as “Lloyds fined £218M over Libor”, and “Prudential Regulation Authority consults on implementing the Bank Recovery and Resolution Directive”. Bank fined How Much for dodgy banking practices? Which multinational conglomerate are you? People love spoilers. There is something about finding something out ahead of time that is both intoxicating and attractive. If an article says “Spoiler alert”, I will read it even if I don’t watch the television programme it relates to! Why are keen business minds not making the most of this magnificent tool? All too many financial articles start with something dreary, perhaps along the lines of “Industrial output” or “Fed bond”. That’s just not going to get bums on seats! Open with an enticing “Spoiler alert:”, circulation will jump and interest in business will soon follow. In the previous post we confirmed that the British public has only a passing interest in business. Having identified the symptoms, a wise and careful doctor would reflect on his medical training, perhaps consult a textbook or two, in order to come to a diagnosis. Not just what, but why the people of the UK are not engaged. Why do they not appreciate the cruel beauty of capitalism, or at least the many iPads that commerce has created? However that seemed like far too difficult a question for a Tuesday evening, so on this occasion we will skip diagnosis, and start prescribing right away, the business equivalent of the frustrated GP’s immediate antibiotics course. Today’s suggestion is actually a simple one, and it’s all about wording. When I wake up and consider my morning cornflakes, I am in something of a sensitive state, in both mind and body. If I am perusing a paper, the last thing I want to be digesting (even mentally) is anything that might be considered disgusting, let alone gross, lest I see my cornflakes for a second time. It is for that reason that I propose that the Gross Domestic Product (whose naming I have never understood) is changed forthwith to the Delicious Domestic Product. Meanwhile GDP’s unsightly cousin Gross Profit is immediately to become Sumptuous Profit, an altogether more delectable prospect. In one fell swoop the readership of the morning business section will rise, interest rates will move in step, and we are off the mark. HBR has written previously about the current low rate of interest in the UK’s economy. Indeed the Bank of England’s current strategy is to keep it that way, at least until the money men work out what on earth they are doing. In this series, HBR investigates the low rate of interest in the British economy amongst the general public, and tries to work out what is best to do about it. Crikey, that’s a lot of information! How do we read that? Well the first thing to note is that a large chunk of the population is not at all interested in business, so our friends at the Bank of England are not wrong. And it looks like men are more interested in business than women. Now that is interesting, I hear you murmur. Misogynists will be nodding approvingly, while national programs will be launched to get our girls more interested in business. Maybe this is why the boards of the UK are so bereft of female directors? The chart above shows the percentage selecting 6 or 7 (i.e. very interested), vs. the percentage selecting 1, or not interested at all, and isn’t it interesting? 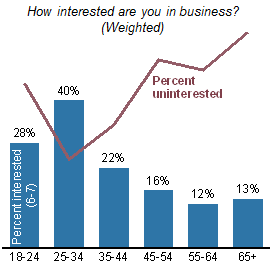 Older people are the most uninterested, while the most interested people are aged 25-34. Obviously the question is whether that means interest rates will naturally rise as people get older, or whether people just lose interest as they get older. Either way that is some intriguing information. So what have we learnt? We have learned to avoid sexist stereotypes, because ladies love business, and we have learnt that data always tells the truth, except when it doesn’t. We have learnt that the youth of today aren’t so indifferent after all. And finally, the Old Lady of Threadneedle Street has been spot on, as when it comes to business, interest rates in the UK remain low.